Last week, I realized I have a problem. I’d just finished browsing the Nintendo Switch’s entire eShop for a second time in search of a new game. That’s a weird thing to do, especially considering that I still haven’t finished Breath of the Wild. I should finish it, but I can’t bring myself to do it. Hours and hours and hours later, I’m bored. Around the same time, I came across a tweet that seemed like it was about my situation. “The reason I hate modern open world games, and especially ones that can theoretically ‘keep going forever’ with meaningless spawns like in Skyrim, is because the game’s ‘end state’ becomes ‘when you get bored,’” said @aSpaceCadette on Twitter. I have a teetering stack of great but never-ending games: Breath of the Wild, Persona 5, Far Cry 5, Horizon: Zero Dawn, Middle-Earth: Shadow of War, every Grand Theft Auto, and yes, Skyrim. I’m about to finally start Assassin’s Creed Origins, and despite the good things I’ve heard about it, I’m worried that it will end up on my attention span’s cutting room floor as well. This isn’t another piece complaining about how Games Are Too Long These Days. Rather, I want to talk about what happens when our personal endings for game after game are a tepid, non-committal “Well, I guess I’m done with that.” No fond farewells, no heroic final acts, not even a satisfying credits sequence. Just the nondescript silence after you turn the television off. There’s certainly an appeal to games that refuse to end no matter how much you yell at them that you have a life, friends, and a houseplant to attend to. Most obviously, the gamerly masses want bang for their buck—raw content piped directly into their audiovisual orifices. But there’s more to it than that. Endings can be hard. Sometimes they subvert expectations, or “ruin” the way we perceived a game and its characters. At the very least, they signal, well, an end. The adventure’s over. It’s time to say goodbye. I remember, when I was a kid, I purposefully held off on finishing games like Kingdom Hearts, Final Fantasy X-2, and Legend of Zelda: The Wind Waker for months after getting within spitting distance of their final encounters. Similarly, I hated things like the ending to Cowboy Bebop—which is not a video game, but which had an ending so definitive that it made it hard for me to fantasize about more adventures happening afterward. Even now, I still feel overwhelmed with sadness when I’m about to finish a good book. There’s something decidedly youthful about an aversion to endings. When we’re kids, we have so much more capacity to immerse ourselves in things, to obsess over them and explore their most obscure depths—to think about them endlessly even when we’re not directly experiencing them. So of course we don’t want those things to end. Letting go is never easy, but it doesn’t descend below the difficulty level of “basically impossible” until we’ve been forced to do it a few times. Who didn’t, as a kid, search for Missingno in Pokemon Red and Blue or try to find the triforce under the castle in Ocarina of Time? For me, those things served as “proof” that those games went on forever—that they were real, magical places and not just digital constructs with finite bounds. Nowadays, there’s a much higher level of general game literacy, and people datamine the crap out of games to discover their exact limits. It’s harder to believe that games are portals to other universes. Even now, though, the desire for games to stretch on forever persists. YouTube channels like The Game Theorists have found massive success in analyzing the lore of games like Five Nights At Freddy’s, Fortnite, and Undertale—replacing the traditional notion of video game “secrets” with infinite speculative breadcrumb trails. The older I’ve gotten, though, the more I’ve come to crave closure in games. Great endings give you just as much to chew on as stories that go on forever. I still think about the decisions I made in Pyre and how they played out both in conjunction with and, most importantly, against my good intentions. Celeste’s conclusion will probably stick with me for years. That game did more in eight hours than most games do in 100. Everything, a game about everything, wouldn’t have hit me anywhere near as hard if it hadn’t decided, practically of its own accord, to end. I have plenty of fond memories of the times I’ve spent playing gigantic games, but closure isn’t involved. Instead, clouds of dull gray hang over those memories, and when I think about resuming games, I find it hard to convince myself to take the plunge. 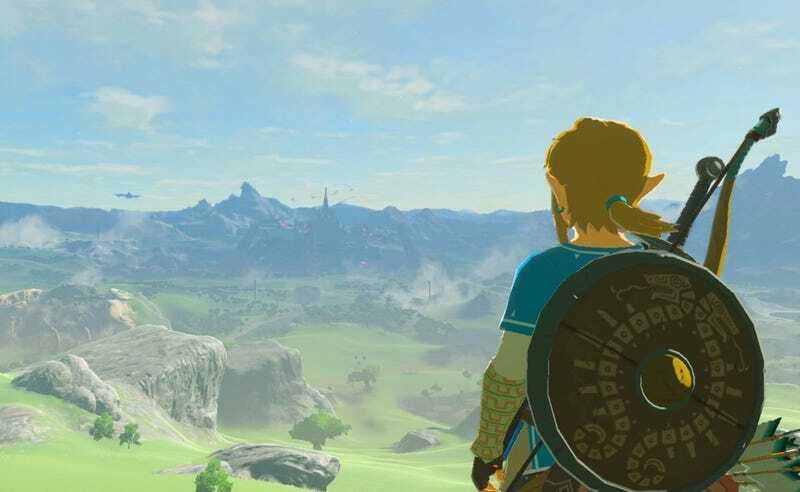 I remember first walking out into Breath of the Wild’s gorgeous world. I remember trying to bypass the Lost Woods with a speedrunning trick I saw on Twitter. I remember “adopting” a dog. I remember feeling my heart pound out of my chest as I approached the Master Sword. I felt like a kid again, like when I first yanked it from a pedestal in Ocarina of Time, and everything changed.